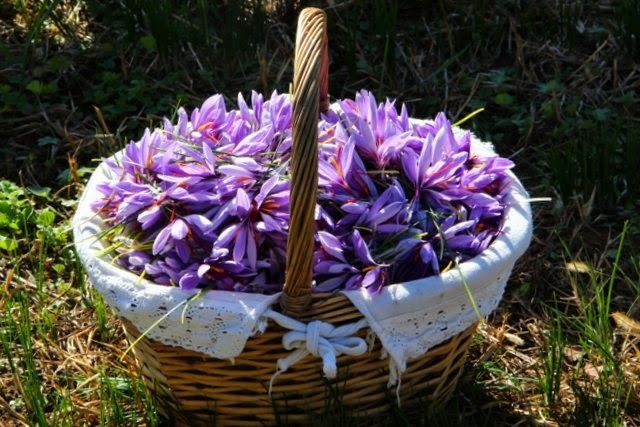 It's time to celebrate saffron! 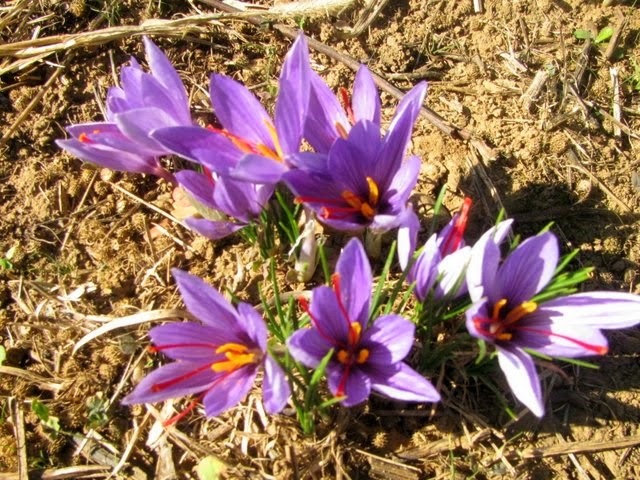 A culinary spice, saffron is usually associated with countries of the near East such as Iran and Kashmir, but it grows many other places in the world, especially in Mediterranean countries. And it grows right here in southwest France! There are several producers in the area surrounding Cajarc and a total of more than 50 producers in the Lot/Aveyron area overall. 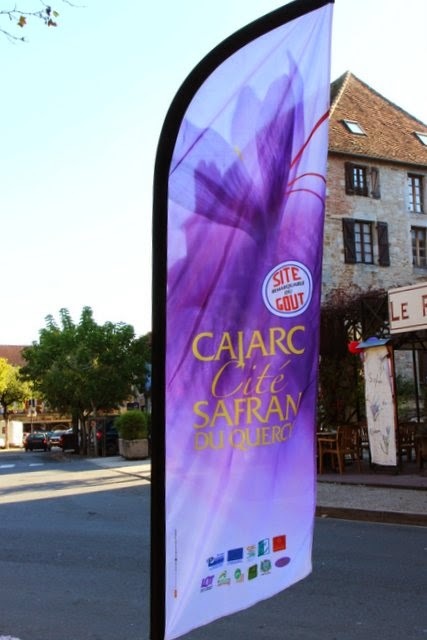 This weekend Cajarc celebrates safran in all its forms. Not only are there tours of safran farms on offer, but safran products are on sale at a special market in Cajarc and local restaurants serve unique menus with dishes spiced with safran. Safran colors of purple and red are everywhere as shops and restaurants compete for the best safran-themed decorations. I elected to tour a safran farm with a friend. 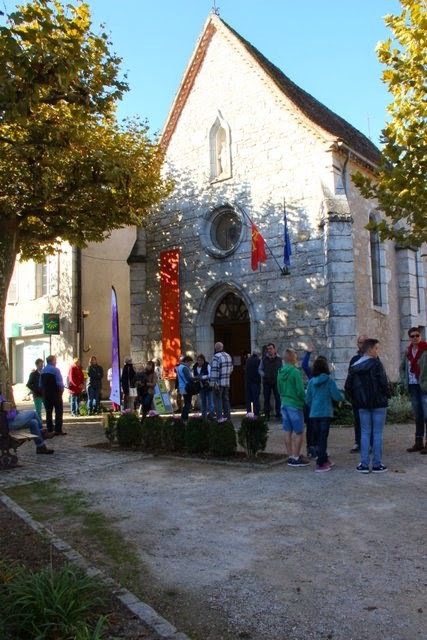 We gathered with many others in front of the Cajarc tourist office awaiting our instructions. A producer introduced himself and then announced a change of venue for the tour. There was a mad scramble for the few maps he held. Luckily, the farm chosen for today's tour was just a few minutes away outside Gaillac and right next door to a friend's house. Everyone dashed for his car and fell in line behind our producer-leader. There must have been at least 50 cars in the line that snaked its away across the river and into Gaillac! A bit disorganized, but tres French! 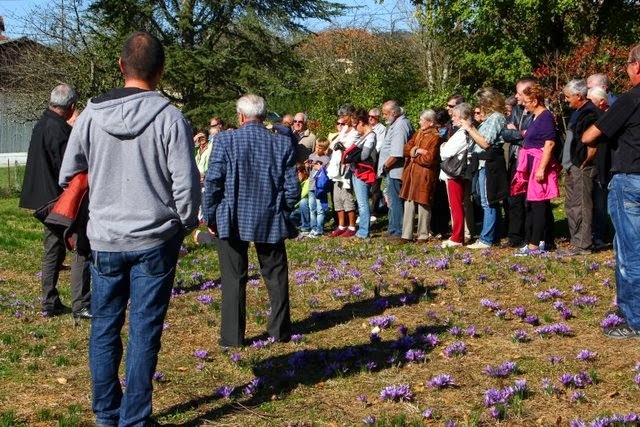 Once everyone had found parking, we lined up along the perimeter of a small field of safran to listen to an interesting presentation about this beautiful fall flower. I'm guessing there were at least 150 people in attendance. 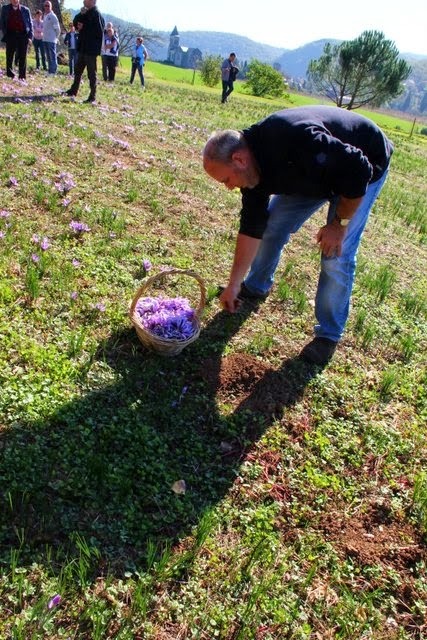 We learned that safran is an extremely labor-intensive crop as the crocus bulbs are planted by hand and then the flowers must be harvested by hand. 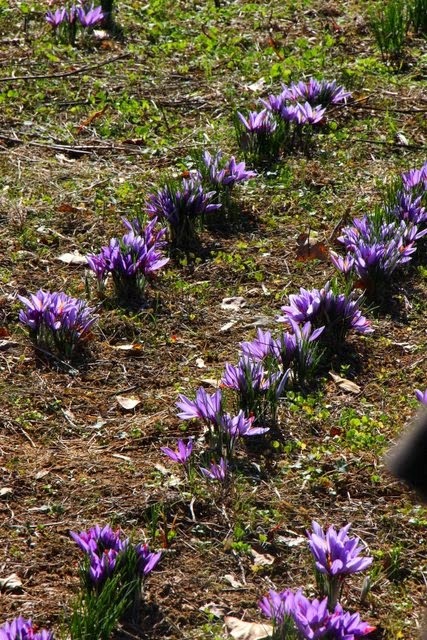 Each bulb produces up to 4 flowers. After picking the flowers, the three stigmas of the flowers are plucked out; these are dried and become the lovely crimson/gold spice. It takes 200,000 flowers to produce 1 kilogram of spice....all of them picked by hand! But the results are beautiful....and tasty! Very busy weekend for my neighbours, the saffron tours have become very popular. A lady frowned at me as I parked blocking my garage...I had to explain it was my house!